There are many ways of making political art. For some the point needs to be made in an explicit way while others are happier to leave things open to interpretation. Though Summer Camp is much easier to make sense of than And Europe Will Be Stunned, which I wrote about here recently, Yael Bartana is clearly towards the open to interpretation end of the scale. 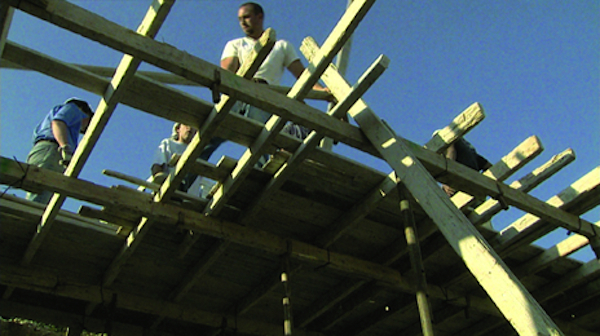 In Summer Camp, Bartana records the rebuilding of the house of a Palestinian family in the village of Anata (east of Jerusalem) by volunteers organised by the Isreali Committee Against House Demolitions (ICAHD), a non-violent direct action group both protests about house demolitions and seeks to rebuild demolished houses. The team of volunteers filmed by Bartana included both Palestinians and Isrealis as well as people from other countries. In a sense then, Summer Camp is effectively a documentary, but as with the films that form And Europe Will Be Stunned there’s more to it than that. Firstly there’s the way the footage is filmed and edited. 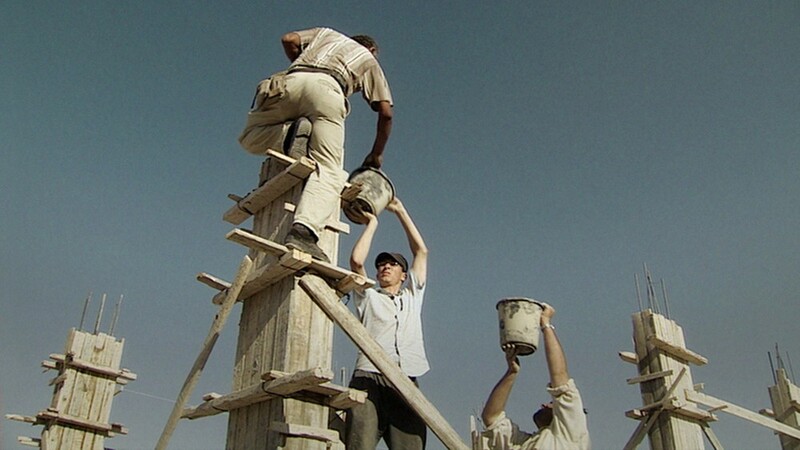 The film is only 12 minutes long so the work of a couple of weeks is hugely condensed – the ICAHD summer rebuilding camps last about a fortnight – into a tight visual narrative, making this effectively a visual montage rather than a documentary. Visually the emphasis is on the cooperation necessary to build in this way: we frequently see things passed from hand to hand. The volunteers presented as heroes. We look up at them and in doing so look up to them, a strategy used in the constructivist posters made in service of the Russian revolution. Bartana has also produced posters in which the volunteers are photographed as heroes above the words Build, Rebuild, Resist. As a simple series these sum up the hope that underpins the work of ICAHD; houses are rebuilt in a spirit of optimism though all involved know that in many cases the house they are rebuilding has been repeatedly built, demolished and rebuilt. 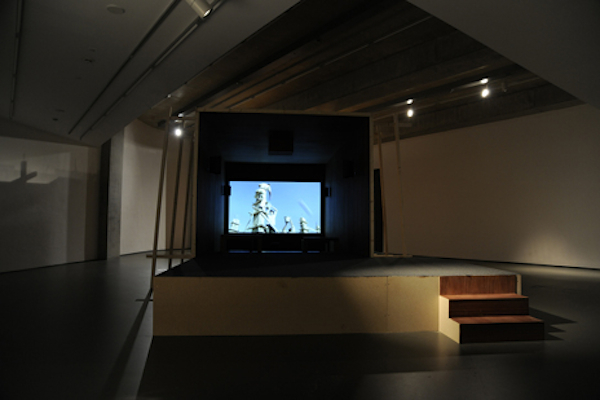 When I saw Summer Camp recently – it’s included in the exhibition The Edge in Landscape at the Towner – it was shown in a temporary structure within the gallery space. This strategy serves as a reminder of the likely temporary nature of the construction project we see on screen. This entry was posted in Film/Video, Installation, Politics and tagged art, documentary, film, installation, Palestine, Summer Camp, Yael Bartana by Ann Jones. Bookmark the permalink.